It is state championship week! The 11-Man classes will crown their champions this weekend, while the state trophies were hoisted in Newton this past Saturday for both 8-Man classes. Kpreps has continued to post state rankings throughout the playoffs culminating in our final poll after all state champions are crowned. Let’s take a look at the Kpreps.com rankings for November 20th. Check out our complete Rankings for further details. The Class 6A poll remains the same this week and our state title game is set. Top-ranked Derby will take on No. 2 Blue Valley in a 6A title game rematch at Welch Stadium on the campus of Emporia State University. Derby defeated Blue Valley 27-14 on the ice in last year’s title game. On Friday, the Panthers defeated No. 4 Lawrence Free State 49-21 in the west semifinal, while the Tigers knocked out No. 3 Shawnee Mission East 35-34 in overtime. After SM East scored first in overtime, Blue Valley decided to follow-up its touchdown with a two-point conversion for the win. Tiger quarterback Matt Dercher hit Blake Brown on the conversion pass for the win. In Class 5A, defending-champion Mill Valley has advanced back to the title game edging No. 3 St. Thomas Aquinas 14-13. The Jaguars will take on new No. 1 Goddard on Saturday at Carnie Smith Stadium on the campus of Pittsburg State University. The Lions ended Great Bend’s season with a 50-21 victory in the semifinals. In Class 4A-I, defending-champion Bishop Miege scored a pair of special teams touchdowns and rolled to a 52-0 win over Basehor-Linwood. The Stags will take on No. 2 Buhler in the state title game in Topeka. The Crusaders’ defense dominated No. 4 Maize South 27-7 in the semifinals holding the Mavericks to 102 yards of total offense. Buhler is back in the title game after winning the Class 4A title in 2013; the last year before the classification split into two divisions. The Pratt Greenbacks remain in the top spot this week after they went on the road and knocked out defending-champion Holcomb, 21-14. It was Pratt’s second win over the Longhorns this season. Pratt will take on Topeka Hayden in the state title game in Salina. The Wildcats won at Holton for a second time this season, 20-8. Hayden defeated Holton 47-32 in district play a few weeks ago. In Class 3A, two-time defending champion Rossville is back on top of the poll and back in the 3A title game. 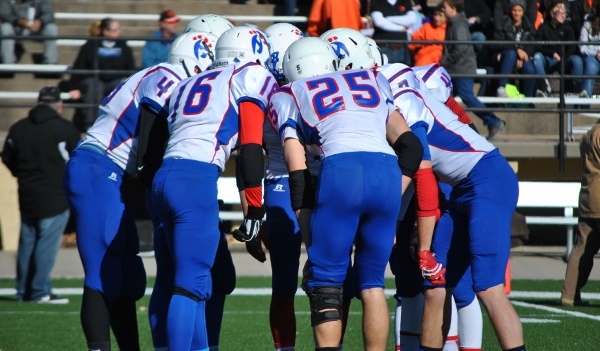 The Bulldawgs defeated Nemaha Central 27-22 to earn a trip back to Hutchinson. There, Rossville will meet the Hesston Swathers in the 3A title game. Hesston, ranked second, knocked out previous No. 1 Hoisington 35-19. Hesston and Rossville also met in the 1992 state title game with the Swathers winning 3-0. The Class 2-1A championship will feature a match-up between the Twin Valley League and the Mid-Continent League for the second consecutive season. Top-ranked Troy will take on No. 2 Plainville at Lewis Field on the campus of Fort Hays State University. Troy beat St. Mary’s Colgan 28-0 to win the east semifinal, while Plainville topped league-rival Smith Center for a second time this season. Plainville shut out the Redmen, 14-0. Last season the Trojans fell 30-29 to Phillipsburg in the 2-1A title game. Congratulations to the Osborne Bulldogs and the Hanover Wildcats for capturing state championships in the eight-man classes on Saturday in Newton. Osborne defeated St. Francis 38-24 in the 8-Man, Division I game to finish atop the 8M-I poll. Hanover topped Dighton 68-22 to win the 8-Man, Division II crown.